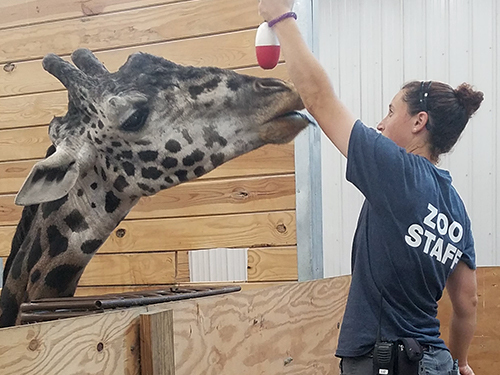 Lehigh Valley Zoo Animal Care Department – Zookeepers are responsible for the care and well-being of each and every animal at the zoo. We spend our entire days providing for our animals by cleaning their habitats, feeding them nutritious meals, training them for their medical procedures and encounters, and engaging in positive interactions. One of the most important aspects of animal welfare is physical health, but there is another equally important aspect of welfare: mental health. One of the most important things we as zookeepers can do to keep our animals happy is provide them with enrichment. Enrichment is any novel experience that the animal can engage in during their day. Some forms of enrichment include sensory enrichment, food enrichment, behavioral and social enrichment, environmental enrichment, and training. Sensory enrichment is perhaps the most common form of enrichment. These things engage the animal’s senses. Scents are very important because many animals rely heavily on their sense of smell to assess and mark territories, hunt for prey, and seek out partners. Providing an animal with a new smell in their habitat keeps them curious and promotes investigation. Auditory enrichment, such as recorded bird calls, is interesting for animals that rely heavily on their sense of hearing. Many prey species have acute hearing in order to listen for predators. Many species, such as birds or some mammals, also rely heavily on hearing in order to locate a mate. Tactile enrichment can be beneficial for animals with strict grooming behaviors, such as large cats who love to rub against brush boards. Food enrichment is an exciting form of enrichment, when we provide our animals with different food items they may not normally receive. Sugar-free peanut butter in small amounts, sugar-free jell-o items, or even different forms of produce that is seasonal that they may not have in their typical diets, like watermelon. One of our wolves’ favorite food enrichment is the deer carcass feed. Every so often, the wolves receive a deer carcass from the game commission, which is very beneficial because it allows for them to practice their natural hunting and pack behaviors. 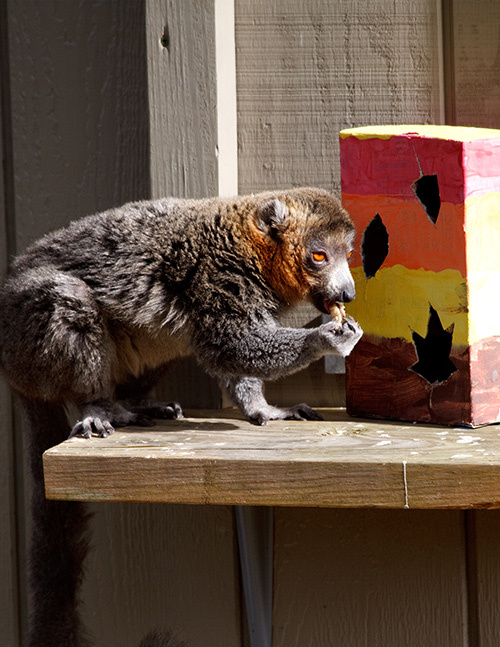 Food enrichment can also include puzzle feeders, which give an animal a challenge to overcome in order to receive a food item. Social enrichment entails connections with members of the same species or members of another species to allow novel interactions. One type of enrichment that falls into this category would be the “travelling” enrichment. We allow many of our animals to traverse the zoo to see other species that have a home here. Our sheep, goats, and alpacas all are examples of animals we train to accept a harness so they can be safely walked through the zoo. Social enrichment can also be with a keeper, however. Environmental enrichment is any novel change to the animal’s daily environment. 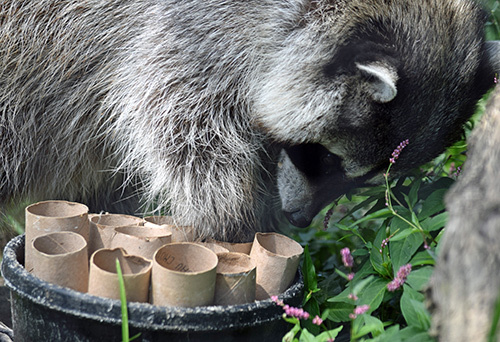 This can include new perching for our birds, new logs for our lemurs, new permanent structures such as a hammock for our raccoon, different substrates like new leaves for our snakes to curl up in, and even interesting new hideouts. Training is one of the best forms of enrichment we can provide to our animals. It helps to solidify the bond between the keeper and the animal, and keeps the animal stimulated through new and exciting activities. Our animals are trained for medical procedures, to reduce any stress that vet checkups can entail. Many animals are eager and excited to train, as they get to work with their keepers, contemplate and complete tasks, and receive positive reinforcement and interactions. All training is one hundred percent voluntary on the part of the animal.